Steven Bereznai is a Toronto-based travel writer and author. 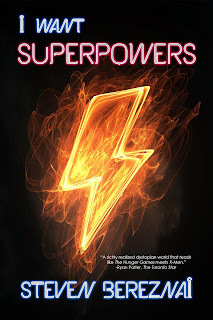 His books include I Want Superpowers, and the gay teen superhero novel Queeroes. He can be reached through his website, www.stevenbereznai.com. The Genetic Wars that ravaged the planet are over. The so-called “DNA regulars” (dregs) and super powered “Supergenics,” now live separately from each other: The Supergenics in the shiny towers of Jupitar City; the dregs across the river, in the squat concrete buildings of the boroughs. But Supergenic children are still born to dreg parents, and under repressive laws must be sent to live with their own kind. 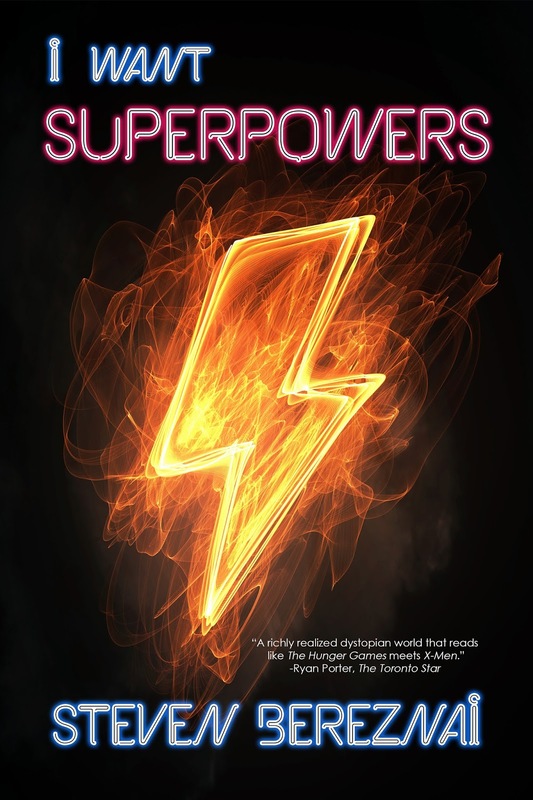 Like all teenagers, socially isolated Caitlin Feral must face her Testing Day, to see if she has any powers. She’s determined to show she does. If she fails, she faces a lifetime of loneliness and crippling labor in the boroughs. But how much is she willing to sacrifice to be the super girl she’s always wanted to be? And when she uncovers dark secrets kept by both sides, does she dare start another war to reveal the truth? “I look ridiculous,” I say, holding up the edges of my flouncy dress in an attempt to keep the hem from catching on the rough wood of our apartment’s floorboards. Other moms would coo or reassure. Mine’s too blunt for that. Think sledge hammer with hearts etched into the handle. She kneels beside me in our dimly lit, one room flat. Our drop down bunks are latched against the wall to give us more space. The chipped and faded cabinets in the kitchenette are scrubbed and our breakfast bowls are drying in the small sink with the rust stain running down its center. According to the label on our rations we ate oats, though they were so pulverized it’s hard to say for sure. Rumor is they mix in sawdust. “There will always be rumors,” my Mom often says. We’re both clothed in head-to-toe red. Me in the dress, she in her coveralls, ready for work. There’s a round patch above her left breast with the image of a cog on it. Marks her as a factory worker. Not the best of positions, but not the lowest either. Still, a far cry from when my Father was alive. She stands, turning me this way and that. I’m keenly aware of our height difference. At sixteen I’m taller than her, which is weird. I’m used to looking up to her, not down. I’m bigger boned too, meaty where she’s porridge thin. I take after my Dad that way. “Stop fidgeting,” she says, sliding a pin into place. She’s tense. I’m tense. Big day and all. Could be that’s all it is. Could be. But her tone puts me on amber alert, like when the border patrols spot a mutated animal that’s made it past the outer wall. Will the Protectors put it down before it reaches the Fence, or will school be cancelled as we hunker down in the shelters? My Mom would not appreciate the mutant-related comparison. I try something new—I keep my mouth shut, waiting to see if her impatience will balloon into something more. I brace myself just in case, imagining that I’m surrounded by an invisible shield that will repel any and all verbal projectiles that she may hurl my way. Wait for it, part of me warns. But today’s a good day. The tirade doesn’t come. Sometimes it’s like that. She’s...unpredictable. My Mother keeps working and I let myself breathe. The only thing having a blow up at the moment is the booming thunder in the distance. We barely notice. It emanates from the roiling black clouds that hover just outside our borough, clouds that just sit there, day after day after day. I can see them outside the small window above the sink. The mass of condensed vapors never expands nor contracts. Never intensifies nor dissipates. They’ve been floating there, stuck, since before I was born. Today I’m especially sad that he’s gone. Other times I’m flat out angry. But it’s been so long now that the feelings are like the storm out there. Never gone, but after years and years of it, the thunder has been relegated to the background—mostly. It makes me wonder about something my Mom said once. That the storm defines our borough and everyone in it, that it’s part of our identity, something about thunder and lightning, sound and fury, signifying nothing. At the time I just thought it was one of those things that grown ups say. Today I’m not so sure. Our borough was established exactly on the border where the clouds end. On a sunny day there’s literally a dividing line. As kids we would dare each other to step over the shadow it cast, and when a kid did we’d all run away squealing. Of course the real danger lies on the other side of the electrified security Fence that the shadow would creep over. I can see the chain links through the tiny window, separating us from the danger beyond. The glass is grimy from the billowing smokestacks of the factory where my Mom works, but I can still make out the orange warning sign attached to the fence post. It’s a triangle with the stylized black outline of a trio of animal heads; hound, lizard, and giant cat, their growling countenances budding like polyps within the triple crescents of a biohazard symbol. Mutant animal alert. “And I think that should do it,” my Mom says, stepping back to admire her handiwork. “Give us a twirl!” my brother says enthusiastically. His name’s Nate. Nathaniel Jarod Feral when he’s in trouble. He’s twelve, with big brown eyes that give him a spooked owl look; makes him appear younger (and more innocent) than he is. His frame is such a perfect combination of our parents I sometimes think a mad scientist must’ve spliced his DNA together in a test tube rather than, you know, that other way. He gets all the luck. Currently, he’s showing off his walking handstand, feet straight in the air, wearing just a pair of pink underwear. They were white until they accidentally got washed with Mom’s coveralls. They’ve been his favorite ever since. He maneuvers around the small wooden kitchen table on his hands as easily as he could on his feet, making good use of his ridiculously broad shoulders. Those he got from our Dad. Combine that with our Mom’s narrow waist and his set of etched abs (honestly, what 12-year old needs that kind of muscle tone?) and the kid looks like he jumped off the cover of a comic book. Some people were just born with the proportions to be awesome, I sigh inside my head. Petty jealousy aside, I love the brat, and give him what he wants, spinning about until the hem of my dress flutters around my ankles. He lands nimbly on his feet and starts to clap. “Please,” I say, making shushing motions with my one hand while the other is egging him on. On this day it wouldn’t be the worst if he kept going for a little bit, but this is Nate. He does one better. He presses his cheek against the fabric covering my belly and wraps his stupidly muscled arms around my back. My Mother grabs his wrist and yanks him away from me so hard I trip into the side of the table. The move is so sudden, so harsh, that it takes a moment to switch gears. For the hour it took to stitch me into the dress she was a Mom born of some dream. She fussed a bit too much, but she didn’t call me chunky as she struggled to zip up the back. When we found a rip in the side she didn’t break into hysterics, demanding to know “how the hell am I supposed to raise two children alone?” Instead she smiled and laughed and reassured me she’d get it fixed in plenty of time for Testing Day. She tricked me into lowering my guard. “Are the headaches back?” I ask cautiously. Maybe it’s a safe question. Maybe it’s not. “I’m fine,” she says, her jaw tense. She’s trying to convincer herself as much as us. Her brow creases as if in pain, and she forces herself to let Nate go. Her lips twitch. Invisible strings pull them into a marionette’s smile. “I’m fine,” she repeats, patting his head with jerky, mechanical motions. She’s trying, a part of me sighs, giving myself a reminder. It’s hard for her. “Okay,” Nate says, testily brushing her arm away and giving her a ‘don’t touch me’ look as he retreats behind me. She eyes me as if there’s an internal pressure sensor inside of her, and the needle keeps veering from the far right danger zone to the far left safe zone and back. Finally it settles somewhere in between. Her face relaxes. Unlike the lightning cloud on the other side of the Fence, this storm seems to have passed. For now. “You need to finish getting ready for school,” my Mother tells Nate quietly. I can tell she feels badly for flipping out. She’s getting low on meds and she’s been splitting the doses. End of the month is always the worst for rations. “Yeah, yeah,” he replies. It’s his new favorite saying. I’m not sure where he picked it up, and though it’s a bit sassy for my Mom’s taste it’s hard to tell him to stop when both of us have started imitating him. He’s obedient, this time, though in his own Nathorniel way. He performs a couple of dance steps, utterly unabashed. His feet are a blur as he twirls around me and he does a majestic leap. He manages to be both a vision and a donk (what my Mom calls a ‘dork’) at the same time. He pulls clothes from his drawers and holds shirts against pants as he plans his outfit. There’s nowhere else for any of us to change. Modesty is for the rich, with their ostentatious multiple rooms in a single home. I vaguely remember that life from when we were younger. Now our beds fold up against the wall, one atop the other. The toilet is hidden behind a screen. We’re given one can of air freshener a month and nowhere near enough toilet paper. Thankfully our toilet flushes. Some people in the borough look at us with envy. Nate sings as he dresses, a tune our Mom used to croon to us, but he’s changed around the lyrics. It was a lullaby about jumping over the moon. He’s transformed it into a love song. It’s raw, and childish, but his pitch is perfect. There are rare moments where his voice breaks on a note he can’t quite hit, yet somehow it makes the song even better. My mother’s frown deepens. She’s worried. The kid’s got talent, but is it the regular kind, or the special kind? I can tell my Mom’s wondering the same thing; hence the concern. I put a hand on hers, trying to be reassuring. The gesture feels foreign. Borrowed from what I’ve seen other people doing. We’re not the touchy feely type and true to form she takes her hand away, resting it above her heart. “His first Testing isn’t for another year,” I say. Safe. The word hangs in the air like a set of manacles. “Sure,” I say, because I know that’s what she wants to hear. She nods in relief. She gives me an awkward hug. It’s so rare I just keep my arms at my side. The important thing is she believes me. If she knew what I was really thinking it would just make her worry. Saying the right thing is a new skill I’m just starting to develop because growing up we were always told to tell the truth. It’s only recently that I’ve come to realize that is a lie. People don’t want the truth. They want to hear what they want to hear. And sometimes the truth can be dangerous. “I’m just glad we’re past last year’s nonsense, and the year before that,” she says. “And the year before that,” I add. “No more funny business,” I agree, and that part is true. You can’t cheat the Test. I’ve learned that the hard way. The good news is if I pass, I don’t have to feel guilty. It won’t be a betrayal to my Mom or brother. It will be what it will be. Either I’m gifted, or I’m not. Please let me be gifted, I beg of my DNA once again, as if force of repetition can make it true. “Of course,” I lie again, and I feel my rib cage twisting as I do, because if I pass they’ll take me from her, from Nate, forever. I try not to think about it, and yet as I do, I wonder, maybe she’s right. Maybe I’m better off just as I am. On that point she and I do agree. The final Testing is the most rigorous. It’s all or nothing after all. Fatalities are rare, but broken bones, scars, head trauma are common enough. Disfigurement is not an impossibility. Forcing a Manifestation is not a delicate process. I heard of a girl who was in a coma for a month and a boy who still suffered vertigo five years later. “Cross my heart,” I say, stacking my middle and index fingers, then tracing an X over my chest. I leave the rest of the expression unspoken. My Mom nods, but she’s not really paying attention to me anymore. Now that one child is almost safe her fretful nature is already honing in on a new target. My Dad used to say she wasn’t happy unless she was worrying about something. I follow her gaze and watch as my brother Nate tries to decide between two equally garish tops. Is his thing for color and textures a sign that he’s ‘special’ or just another one of his quirks? My Mom worries that it’s the former, hence her freakout earlier when he was going gaga over my dress, but there’ve been so many alerts released about signs to watch for it’s impossible to know what’s bunk and what’s not. One year it was ‘allergic reaction to shrimp causes girl to glow in the dark,’ another time ‘boy projects own shadow after winning bicycle race.’ For a year after that anyone between 13 and 16 years old received packets of desiccated shrimp in their rations and were required to learn to ride a bike in extracurriculars. She hands me a worn decorative box just slightly wider than the palm of my hand. The box has a ratty pink bow on it. I do, lifting the lid off and my eyes sparkle at what’s inside. “I know it’s a little on the girly side for you,” my Mom says almost apologetically. Her jaw is clenched. Only now do I realize she sometimes braces herself for my moods too. “I love it,” I say, and that is the truth. It’s a simple plastic coronet, but it looks like gold, if you ignore where the paint’s peeled off. I place it atop of my blandly black hair, tied back with a strip of red ribbon. “It was mine, when I was a girl,” my Mom says. “Did you wear it at your Testing Day?” Nate asks as he puts on mismatched socks. I can’t actually. My Mom’s hair is so short it’s basically shaved. It’s practical and easy to maintain. No need for a hair net, like some of the other factory workers. I gaze at my reflection in a cracked mirror between our bunks. I squint just a little, to create a filter that distorts reality just enough so that I no longer see me. I don’t see a fairy princess either. I see her. The me I wish to be, a girl with a cape and a hero’s circlet around her brow. A girl who can fly, or lift a bus, or teleport away. Maybe all three. Today is my final Testing Day. Today I find out if that’s the girl I get to be. For more information about the book, head on over to Bereznai's website at www.stevenbereznai.com. Thank you for sharing with us Steven! *Permission to post first chapter received from author.